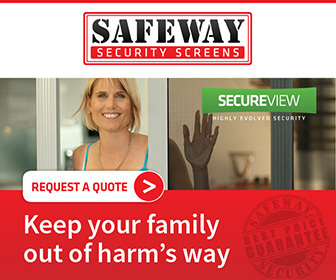 We are a family owned Security Screen manufacturing, supply and installation business based in Perth, Western Australia. We have been manufacturing and installing quality Security Screen Doors, Security Screens & Security Flyscreens in Perth for over 28 years. A proud member of the local security industry our Security Agents Licence number is SA01385. Whether you are looking for a sleek looking marine-grade Stainless Steel SecureView Security Mesh Door, a Perforated Aluminium Security Screen or a Diamond Grille Aluminium Security Door, we are sure to have a security option that matches your style and budget. We pride ourselves on our service and only use quality components. This is why on all our Security Doors and Security Screens we are able to provide our Best Price Guarantee, a Lifetime Break-In Guarantee and impressive Lifetime Warranty on components. Our sliding Security Screen Doors come with Whitco triple locks for added security and all of our products are tested to comply with the latest Australian Standards, 5039, 5040-1 and 5041. We service all of Perth and accept payment via Credit Cards, Cash, Cheques or Direct Deposit and even have Interest Free Payment Plans available. Of course all of our quotes and initial security assessments are free for your convenience. Why not call to discuss your individual security needs today? FREE onsite quote in 5 days.